Cousin Sip had one of Storm Brewing’s new refillable bomber bottles and because she’s going through a month of trying not to drink (what an odd concept! ), she was practically forced to give the amazing brew to me, before the beer went bad. In my travels, I’ve never seen refillable bombers (growlers and Bostons seem to be the norm), so I hope this is a new trend that will spread across the land. The Vanilla Whiskey Stout is pretty easy to sum up: it’s spectacular. The beer is strong and flavourful, with a blend of vanilla and whiskey tastes. The smell is also very inviting and we all marvelled over how good it smelled after being trapped in its bottle for as long as it had. 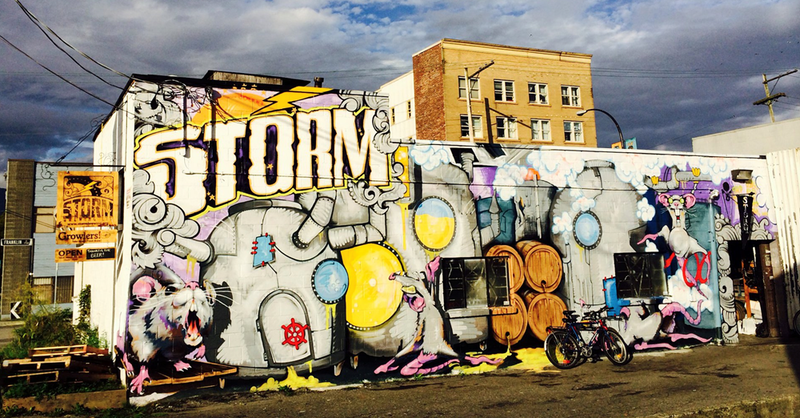 For those that have yet to visit Storm Brewing, it should be on every local beer aficionado’s bucket list. When you first enter, though, you might think the brewery has no interest in their customer’s experience. I urge you to push on, my little sippers, and you will meet one of the best staffs in the game. Aside from the people, the beers are amazing and ever-changing, with a list of “Brainstorms” that is updated regularly. I promise you will fall in love with the brewery that features a rat as their mascot. You won’t find Storm beers at any liquor store, but some selections can be located at bars around BC’s Lower Mainland. The Vanilla Whiskey Stout has quickly become one of my favourites and it’s totally worth the effort of searching high and low for a serving… or convincing you cousin to share the joy! This entry was posted in BC Beer Baron and tagged BC Craft Beer, Craft Beer, Refillable Bomber, Storm Brewing, Vanilla Whiskey Stout by Daniel Wilson. Bookmark the permalink.